Hiya guys. How's it going today? It's been a long weekend and I took a lot of time for myself. That is not something I normally do so it was nice to sit back and not worry about anything for a change. Now it's back to the grind! I did miss my nail desk and to start off the week I'll be showing you guys a stamping plate from the brand new store It Girl Nail Art Shop. I've done four different manis to showcase some of the intricate patterns on the plate. Let's take a closer took. 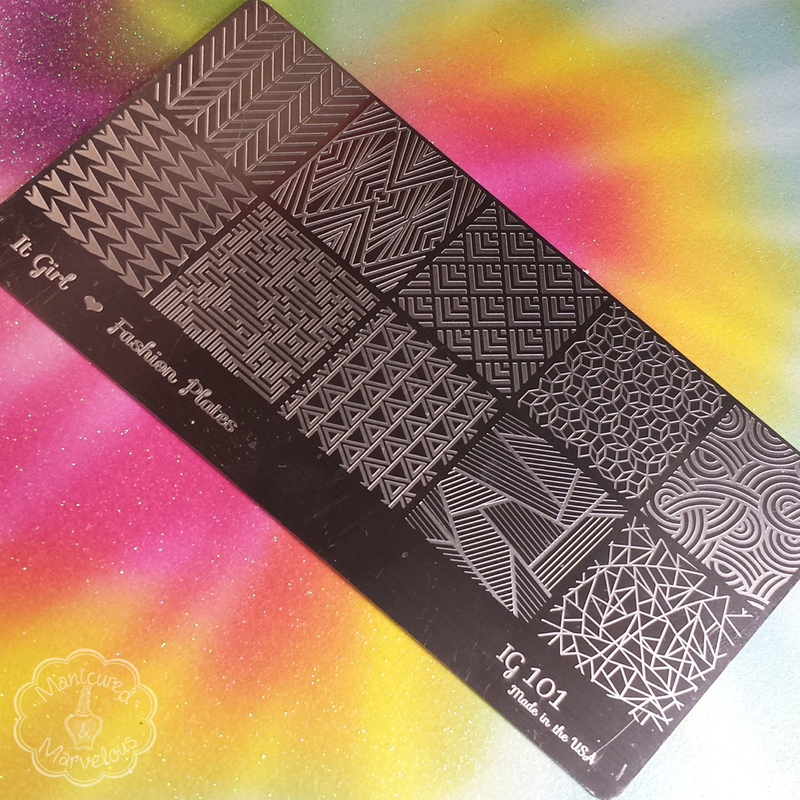 The 'It Girl Fashion Plates' from the It Girl Nail Art Shop are still available for pre-order, but only until tomorrow Tuesday, August 4th at 11:59 PM. During this pre-order period, they are offering a bundle of all three plates for $35. Once pre-sale is over, the bundle deal disappears and the plates will only be available individually. This is the first plate in the Fashion Plate series and it is numbered 101. Each plate is a medium rectangle size and has ten different images. I'm very impressed with the quality of the plate and the etching on each one of the images. I was expecting to maybe have one or two that wouldn't transfer well, but that totally wasn't the case. 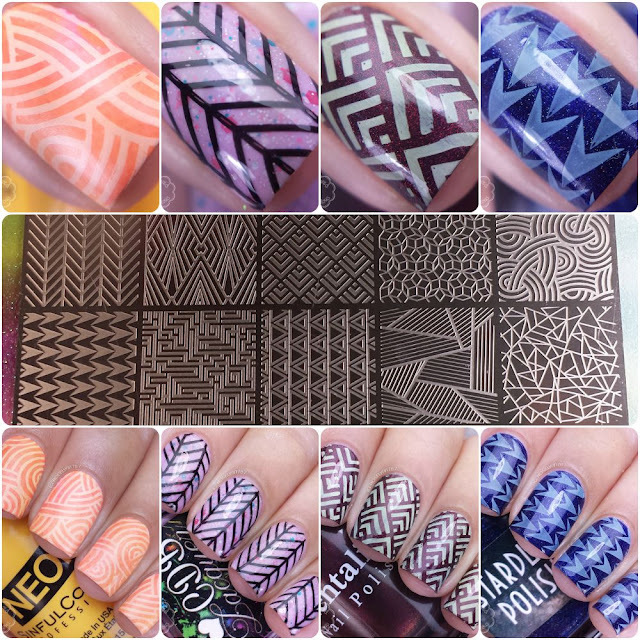 For each one of the manis below I used my Creative Stamper, plastic scraper, and a specialty stamping polish from either Konad or Rica Nail Polish. No touch-ups were done to any of the patterns. Very quirky pattern. I can see myself using it with maybe an assortment of rainbow colors for a psychedelic look. 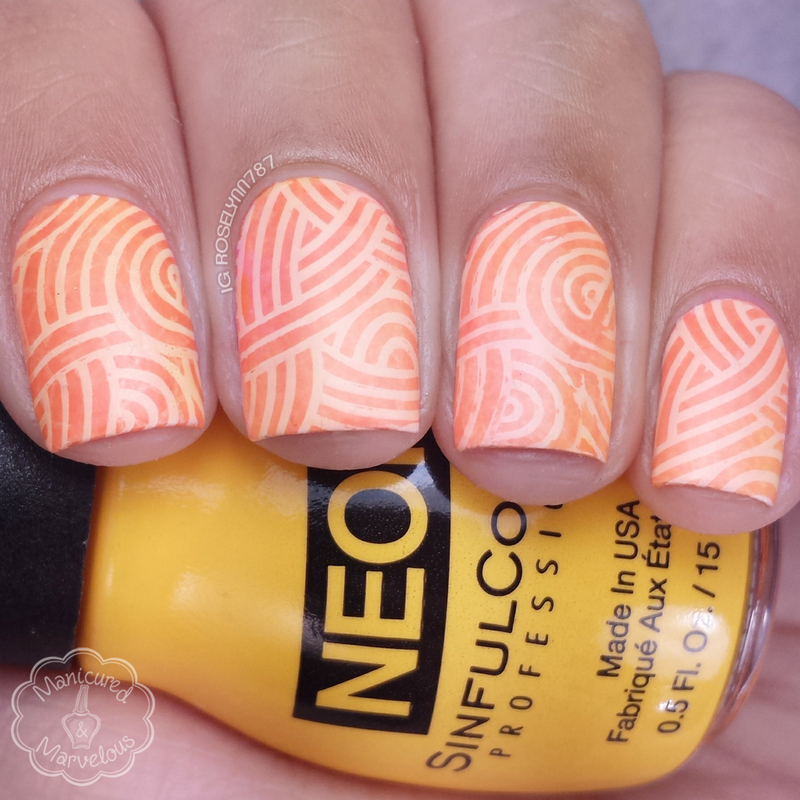 I used the entire Sinful Colors neon collection sponged as a base and stamped over it with a white polish from Konad. You can see the pattern break on my ring nail if you look closely, that's fault of my own and not the pattern. My favorite pattern of the bunch without a doubt! 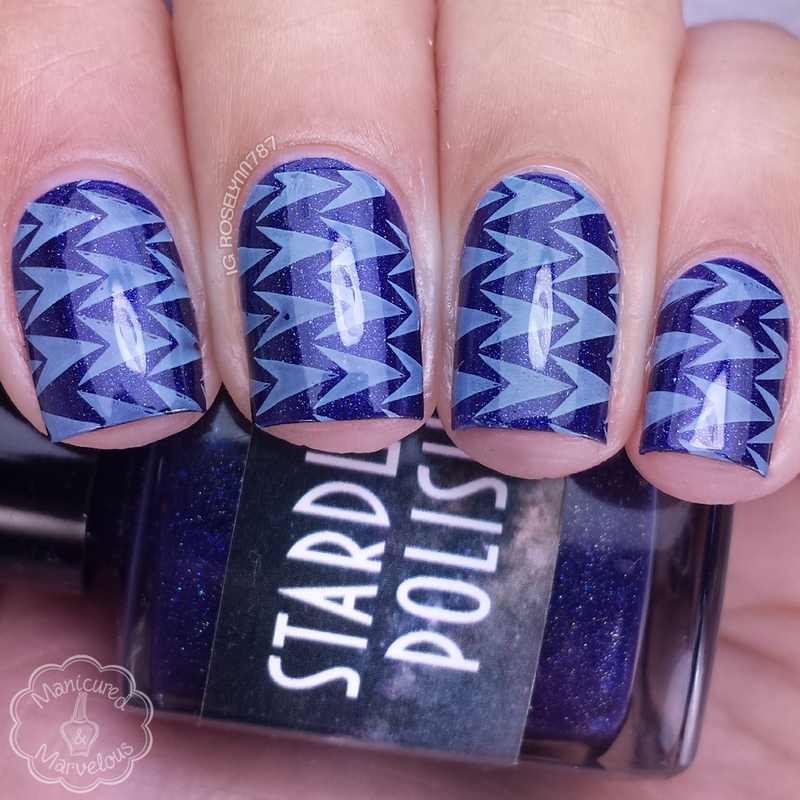 I ended up using this twice for different manis, but this is the one I decided to go with for the blog. It's a very sleek and clean design. Shown here is CDB Lacquer Bday Surprise as a base and Konad Black as the stamping polish. Another very crisp and sleek pattern from this plate. I was not expecting to be so in love with this one as I ended up being. 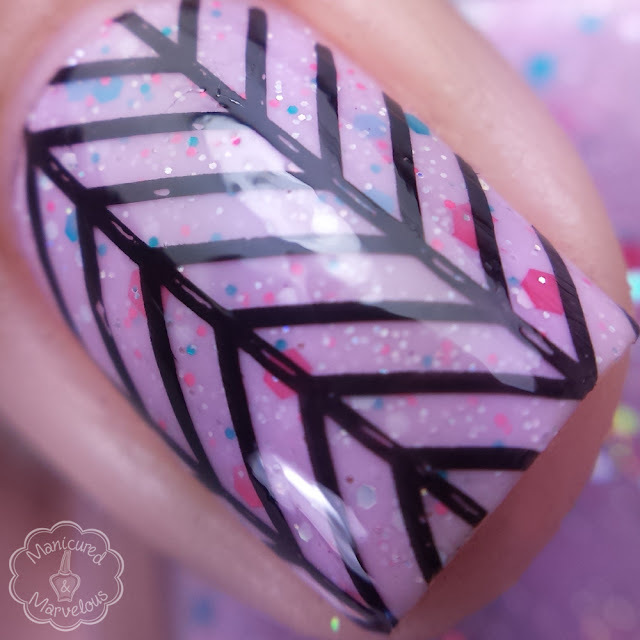 The arrows have a really nice flow and it was so easy to line up to stamp. Stamping polish for this design was from Konad. I feel like my color choices don't do this gorgeous pattern justice. I'm definitely going to have to do this one again sometime because I cannot stop thinking of how cool it would look with some lead-lighting. The base polish is Tempest by Mentality Polish and the yellow is from Rica Polish. Overall I'm very impressed with the quality and design of each one of the images on this plate. 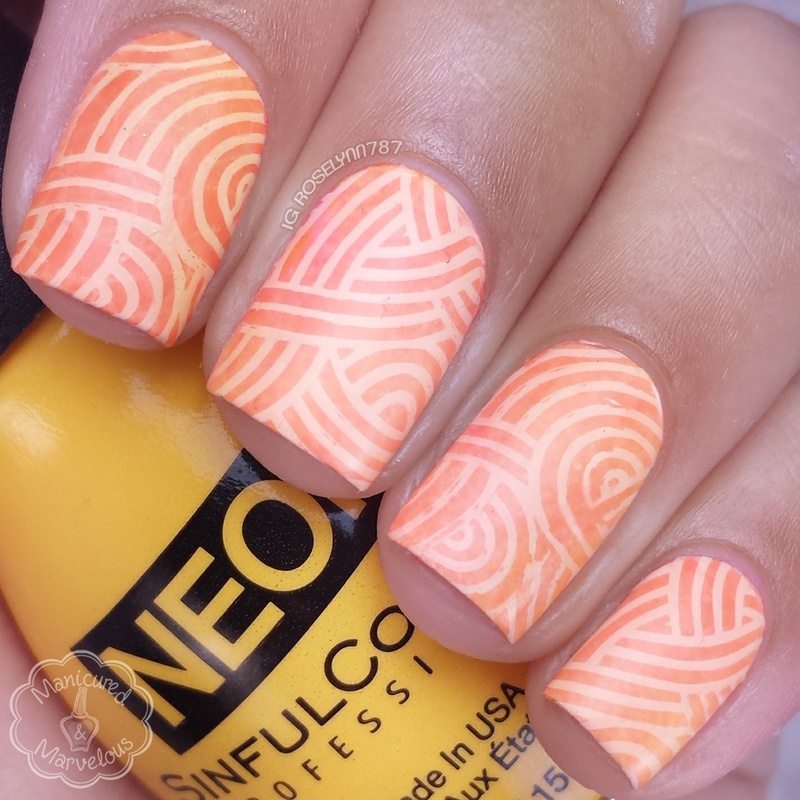 I'm a huge fan of patterns like the ones shown here that give you full nail coverage. I like how much variety in the imagery this particular plate gives you. I can see a lot of the designs being implemented with double-stamping or lead-lighting techniques easily. If you're a stamping fanatic like myself I definitely recommend picking these up. As I mentioned before, the pre-order sale ends tomorrow night. The bundle price of all three plates for $35, which you won't be able to get once this pre-order period is over. 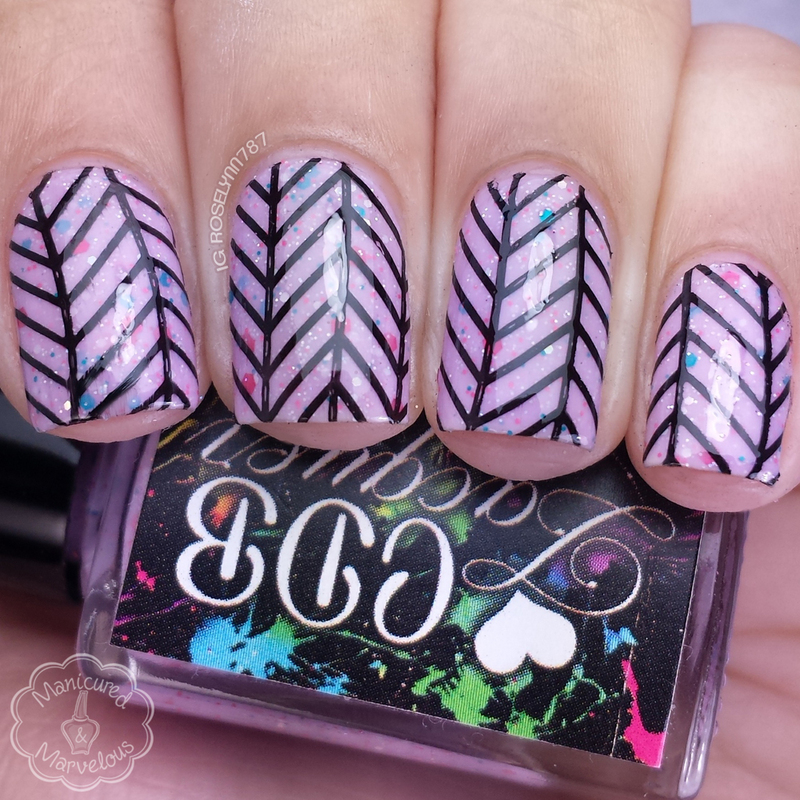 Are you a stamping fan? Are you as excited as I am to see a new plate shop opening up? 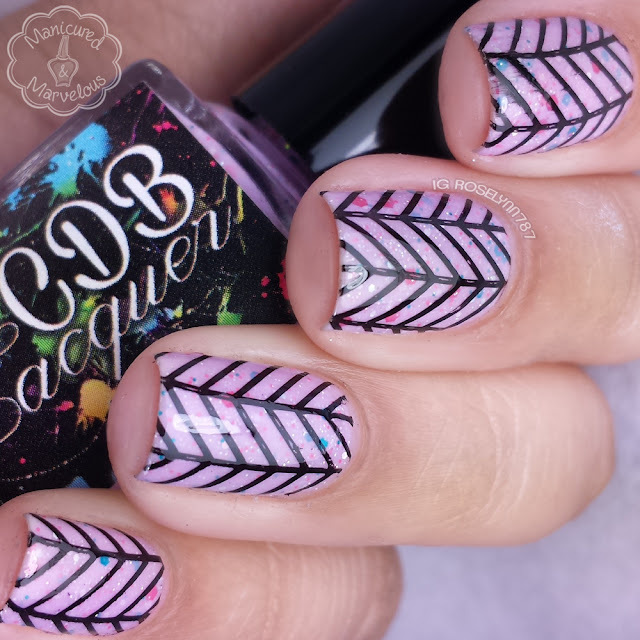 Stunning manis! These plates look amazing! I love all these patterns, but that first one is AWESOME! Stamping is my favorite! :-p These plates look great! I love the designs you chose to showcase. hi! wow love your blog, this review was so helpful!! i am following you right now :) please check out my blog www.chiclystylish.blogspot.com and follow back! would love to work together ! Need this plate! You make me want everything! Wow! I love how crisp the images are! I love all four looks you did with this plate. Then one you did over the CDB the best. Such a fun look! Great mani's! I've had my eye on these plates! There is nothing wrong for taking a day to yourself at all!! I hope you enjoyed it :-) I REALLY need this plate now, especially after seeing your inspiring creations!!! Aren't these the best. I got the 103 and love it just as much! This plate is pretty awesome. Love all the geometric designs! 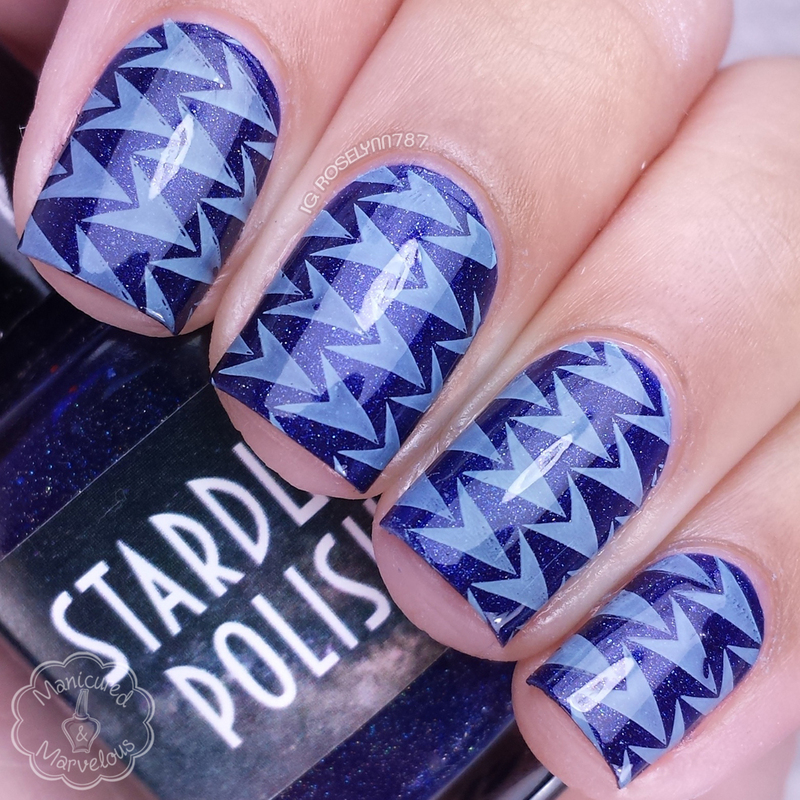 I love geometric patterns so this plate just made me drool! 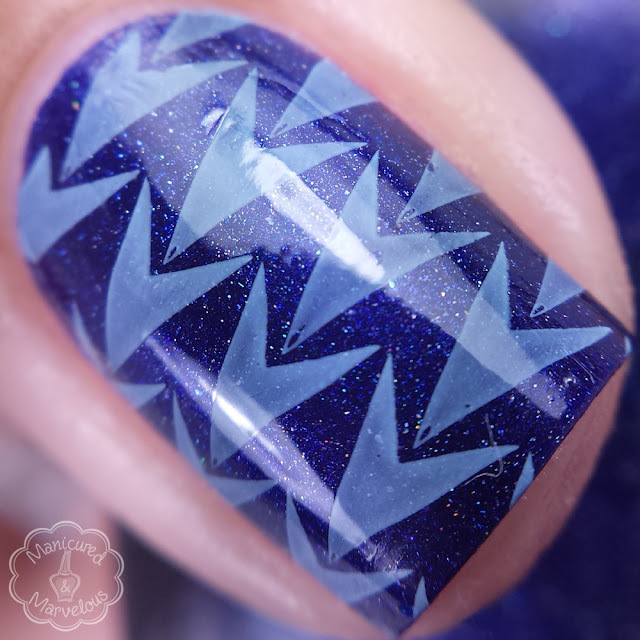 Your blue mani is to die for! The patterns on this plate are great and you picked perfect colors the pair together. Really fun manis! I'm liking the looks of this plate! I love the patterns on these! These types of repeating patterns always call to me when I'm stamping. oh my goodness - perfection! You are amazing at stamping! I totally need these plates! Great review and beautiful stamps! I too need these plates!!! I am ready for my replacement plate to get here!! Can't wait to try stamping for the first time. Great review!